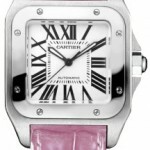 The Cartier Santos 100 Women’s Watch is an elegant, medium sized, luxury watch for women. The Santos 100 for women comes in different styles and colors. Available in stainless steel and 18k gold, with a choice of a pink, burgundy or black alligator straps and optional bezel set with round cut diamonds, this watch is a must have for self-proclaimed “fashionistas”. The W20106X8 Cartier Santos 100 woman’s watch features a steel octagonal crown set with a facetted spinnel, silvered opaline dial with roman numerals, on an alligator strap with an adjustable buckle. It has an automatic (self winding) movement and is water resistant to 100 meters (330 feet). The dial is silver and the dial’s texture is guilloche. The crystal is sapphire and scratch resistant. The case and bezel are stainless steel and the case measures 32 mm (1.26 in). The case back is screwed down. Made in Switzerland, the watch comes with a 12 month warranty. The Cartier Santos 100 was launched in 1911 by the founder of the House of Cartier’s grandson, Louis-Francois Cartier, who introduced the Santos to Cartier’s timepiece collection and began Cartier’s rich history of fashion watchmaking. The Cartier Santos 100 has been seen on top fashion editor and celebrity stylist Rachel Zoe. She even chose the Santos 100 as one of her favorite watches.